I read this article and found it very interesting, thought it might be something for you. The article is called City of Hobart take an advocacy stance on single use plastics and is located at https://www.bangthetable.com/blog/city-of-hobart-take-advocacy-stance-single-use-plastics/. As Australia’s second oldest capital city after Sydney, City of Hobart has a rich and proud history of community and natural heritage. Situated on the on the entrance to the Derwent River, City of Hobart is famous for it’s natural surrounds, clean air and world renowned fresh produce and culinary cuisines. As a City who’s economy thrives on a multi-billion dollar tourism industry, City of Hobart has a strong focus on working with their community to protect their natural environment and heritage. Recent initiatives such as their Waste Management Strategy 2015-30, which aims to achieve zero waste to the Hobart Landfill by 2030, provide a perfect example of just how important and respected the natural environment is to the Hobart community. Initiatives such as this also demonstrate how the City and community frequently work together in driving policies for sustainability and clean futures. In their Single Use Plastics consultation, City of Hobart again demonstrates its preparedness to work closely with its community on issues of environment. In this consultation, City of Hobart sets out to tackle “the distribution of single-use, petroleum based plastic packaging, like straws, cutlery, lids and containers, from takeaway food outlets,” to ensure it can achieve its zero waste in landfill targets while protecting waterways and the environment. Taking an advocacy stance on the single use plastic issue, City of Hobart decided to consult their community to get their views on lobbying the State Government to broaden the scope of its current plastic bag legislation to include non-compostable single-use takeaway food packaging. To do this they utilised a single EngagementHQ project page to test some key aspects of issue and to determine to what extend they should lobby the State Government. Using a multi-page pinned survey, City of Hobart first decided to test their communities understanding and awareness of the issue. Questions about attitudes, current habits and also preparedness for behaviour change were tested. These types of questions provide an important set of inputs for any advocacy style consultation, as they allow for better interpretation of the communities position on the matter prior to you advocating on their behalf. One of the question asks, “how much extra are you prepared to pay?” and explores peoples willingness to pay more for change. We think this is a great style of question as it get participants to think about the financial impacts of their changes and allows them to weigh-up those costs against the environmental cost of doing nothing. 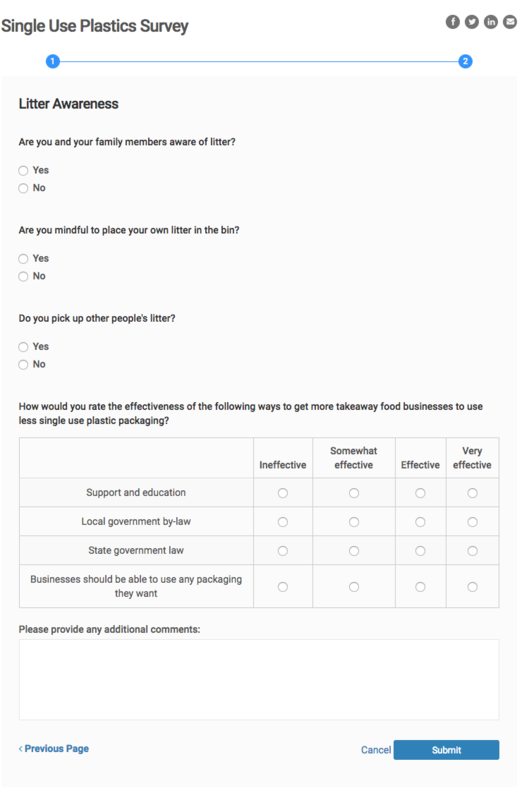 One the second page of their survey, City of Hobart utilised a likert scale question to ask about perceptions of the effectiveness of different agencies and programs in encouraging takeaway food businesses to use less single use packaging. Likert scale questions provide a clear way to test the same question for several different options and we like the way City of Hobart has utilised a four point scale to do this and think this question is a great addition to the survey. Finally, City of Hobart conclude their survey with an open ended essay question to capture further input from the community on the issue. We think this is a highly effective survey that captures some useful information to help the City of Hobart with their advocacy campaign. 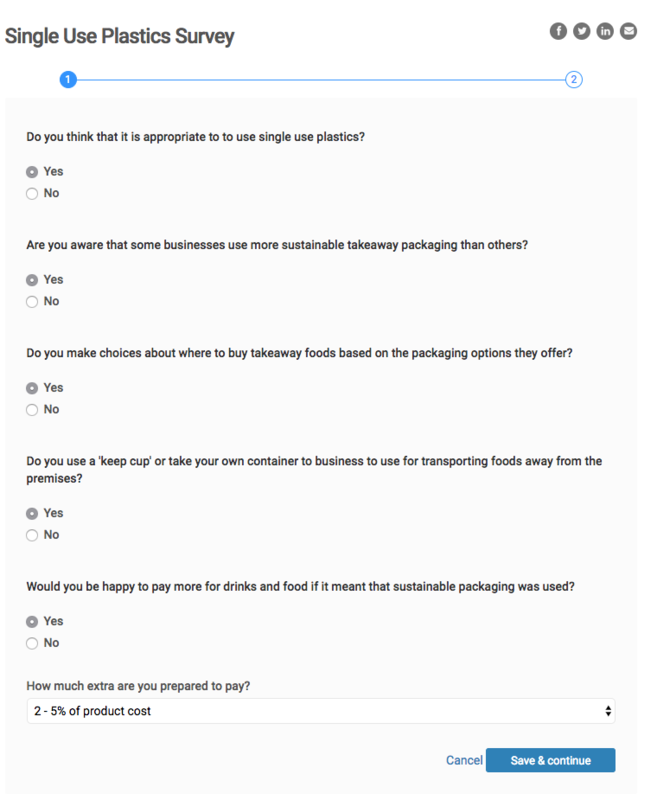 Another important aspect of the Single Use Plastics consultation was the inclusion of a quick poll question. Quick polls are a great way to capture sentiment and their use in this context was a really clever way to quickly capture authority to advocate on the issue. 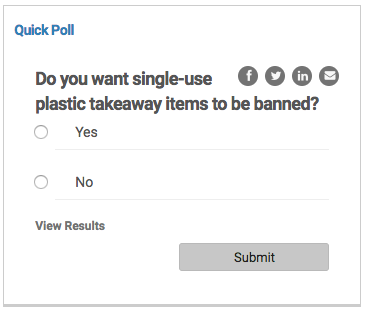 A simple question, “do you want single-use plastic takeaway items to be banned?” creates a low barrier to entry for participants and allows the City to understand the position of the community from a decisive yes or no position. Couple these two engagement tools with the use of frequently asked questions and external links, as well as a well structured project description, and the City of Hobart demonstrates just how easy it is to setup a rounded online engagement project to achieve their goals. City of Hobart received a fantastic response for their consultation receiving thousands of responses to their survey and quick poll questions and drove awareness of the project through social media and email campaigns. Overall, City of Hobart has created a simple and effective consultation to inform their advocacy ambitions and by doing so, have maintained their special relationship with their community on matters of protecting their natural environment and heritage.